Scientists at the University of Leicester have opened up a whole new approach to the therapeutic intervention for a family of anti-cancer drug targets, thanks to a completely new and unexpected finding. Professor Schwabe and his colleagues, Drs Watson, Fairall and Santos, have published their research this week in leading science magazine Nature detailing a new understanding of how transcriptional repression complexes work. 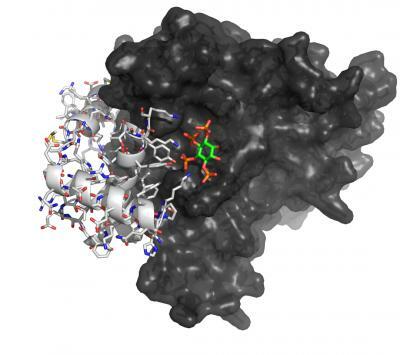 Their work, which is based around determining atomic resolution structures of medically important bio-molecular complexes, has been ongoing for six years, and is currently funded through a £1.4 million grant from The Wellcome Trust. Transcriptional regulatory complexes play an important role in the regulation of development, differentiation, cancer and homeostasis. Transcription is the process of creating a complementary RNA copy of a sequence of DNA and is the first step in the process of gene expression. Professor John Schwabe, of the University of Leicester’s Department of Biochemistry, said: “We have discovered a completely new and unexpected link between inositol phosphate signalling (in this case IP4) and the regulation of histone deacetylase enzymes and hence transcriptional repression or gene silencing. “In simple terms, we have shown that IP4 acts as a natural signalling molecule to regulate histone deacetylase enzymes which play a key role in regulating gene expression. Apart from the considerable intellectual importance of understanding how transcription is regulated, repression complexes are important therapeutic targets for a number of cancers including several types of leukaemia. Professor Schwabe said that this research is not only an exciting breakthrough in the field, but is also a technological feat relying on both the excellent research facilities in Leicester and the microfocus X-ray source at the Diamond Light Source in Oxfordshire.